00:37:00 Makes 6 servings, 1 cup each. Cook and stir chicken, peppers and garlic in large nonstick skillet sprayed with cooking spray on medium heat 5 to 7 min. or until chicken is cooked through. Stir in water; bring to boil. Stir in macaroni; cover. Reduce heat to medium-low; cook 10 to 12 min. or until macaroni is tender and just small amount of water remains. Add spinach and Velveeta; mix well. Cook 5 min. or until Velveeta is completely melted and mixture is well blended, stirring frequently. This low-calorie low fat meal is so easy to make. 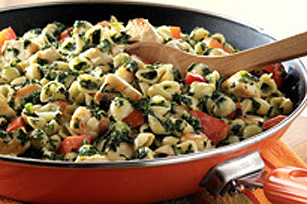 It's also an excellent source of vitamin A from the spinach and contains vitamin C from the red pepper. Serving Size Makes 6 servings, 1 cup each.